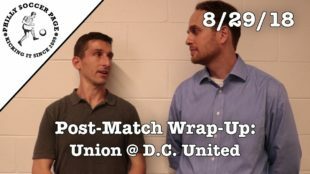 Check out PSP’s video content from the Union’s 2-0 win over D.C. United. Thank you for watching! Make sure you subscribe to our YouTube channel to up to-the-minute notifications for when we post a video or go live. Now that’s a post-game duo! Agree; fun game to watch; fun Interview to watch!